The Cabin in the Woods | Anime etc. 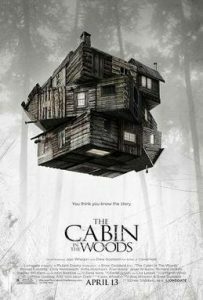 The Cabin in the Woods (out now), produced by Joss Whedon, directed by his former Buffy collaborator Drew Goddard, and written by both of them, has had a favourable reception from reviewers. The film is polished, cute and amusing but it’s still a potboiler footnote to the aged meta-horror-comedy cycle, sixteen years after Scream. It opens well, finding a real way to break genre rules by having two middle-aged office men (middle-aged office men!) discussing domesticity. Both characters are fundamental to the plot, which otherwise involves a Scooby gang of clueless kids (no dog) driving to the cabin – in the woods, by a lake, etc etc – for slasher-film rituals. The film’s fans have begged reviewers not to reveal Cabin’s secrets, though the film itself does early. I will gripe, though, that Cabin’s choice of woodland menace is hugely disappointing (especially when so many alternatives are offered); while the film’s ogling of a horny marked-for-death babe becomes more obnoxious when the script smugly points out the stereotypye. One “surprise” death would have been hilarious if it hadn’t been signposted an hour before. The last act is the best, turning the film slimy, splattery and fantastic (why aren’t there more creature features that deliver their monsters by elevator?). And yet Cabin remains a shallow Friday-night crowdpleaser, down to its last-minute guest star. The one truly upsetting moment is a reverse of the opening, as we’re suddenly yanked from slasher atrocities into a dorky middle-aged office party. Like Scream, Cabin is stolen by its nerd, a bong-smoking Shaggy type played by Fran Kranz. (“Nemo, you gotta wake up!” he exclaims, thumbing through Winsor McCay strips.) It also features a pre-Thor Chris Hemsworth as one of the teens – the film was shot three years ago, then delayed by MGM’s woes. That’s great for the marketing, but he’s still the least interesting of the gang. Still, it suggests the next big post-Scream meta-horror flick. Just team up Hemsworth with Johnny Depp and Kevin Bacon, all playing A-list stars with slasher-film skeletons in their early careers.